My friend Rogene at Gluten Free & Loving It recently shared her own recipe for Greek Pizza, which gets rave reviews when she makes it for her family. It looked really good, so I decided to make my own spin on it. For the crust, I used a variation of a recipe Lisa Williams shared for Naan Bread. I modified the portion and made this into a thin crust. And the result was a fabulous pizza! This is obviously not dairy-free, but I am convinced that a pizza can be made to accommodate any food allergy. What have you tried? Image by cafemama via FlickrBy now you’ve probably heard about the Florida school district where parents are protesting against measures to keep a food-allergic child safe. As the case becomes even more high profile, I was struck by this Today Show video, aptly titled Child’s Peanut Allergy Drives Some Parents Nuts. Her response? “I really can’t answer that question because I don’t really know…” and she goes on to stress that they DO want the child to be safe. Complaining that their children shouldn’t have to wash hands to keep one food-allergic child safe is akin to complaining that the wheelchair ramp for the one child in a wheelchair should be taken down because it takes longer for the rest of the kids to get into school. No parent would complain about the wheelchair ramp because they understand that the disabled child has no other option to get into school. They can see it. But food allergies are not as visible, making it harder for those who haven’t witnessed a serious allergic reaction to understand. It’s all about acceptance, and tolerance, and yes – sometimes it means that we will have to give up something to keep others safe. 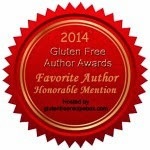 It has taken me a while to get through Shauna and Daniel Ahern’s award-winning Gluten-Free Girl and the Chef that I received as a Christmas gift. Why? 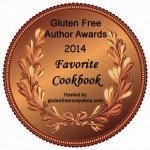 Because it’s chock-full of exquisite meal ideas, stories, and most importantly – tips for both making and eating great gluten-free food. I have a feeling that the authors would appreciate me savoring every bite of their work. The focus of the book is not individual recipes, but meals. I love that the authors give you the whole plate – not meats, then sides. And they really do seem to love veal! This is not a cookbook for vegetarians, vegans, or those with allergies to milk, eggs, or nuts. There is quite a bit of milk in the recipes, as well as cream and cheese – lots and lots of cheese. For example, the crème brulee is almost all eggs, milk, and cream. Danny Ahern gives a brief tutorial (one page) on gluten-free baking, and like most gluten-free bakers he recommends adding extra protein to gluten-free breads by adding more eggs or milk, but of course, that’s not an option for those of us who need to bake without milk and eggs. Nevertheless, there are some recipes like gluten-free focaccia bread that I think I can adapt. And I can’t wait to try the gluten-free crackers! Despite the lack of allergen-free recipes, I am gushing over this book, and recommend that everyone add it to their cookbook collection. For me, it’s not about the recipes; it’s all about the ideas. Vietnamese cinnamon? I have to try that! Making a port reduction sauce? I bet I can do that without butter! Millet tabouleh? That’s one I can try as is! For years I’ve been making my own (wheat-free, milk-free, soy-free, egg-free) breadcrumbs. Most recently I’ve been using gluten-free corn flakes to make them. I simply throw the corn flakes into a food processor, turn it on, and voila! breadcrumbs. Last week at the grocery store I scanned the gluten-free aisle for new products (at least new to me), and came across these Glutino gluten-free breadcrumbs. The ingredients are very simple – milled corn, evaporated cane juice, sea salt. Surprisingly, these are the exact same ingredients as in the corn flakes I buy. I decided to try them. I like that the crumbs themselves are very fine – much finer than I can make on my own with the equipment I have. Even more surprising was the fact that the Glutino breadcrumbs were less expensive ($3.79 for a 12 oz package) than the cereal ($4.99 for an 11 oz package). I’ll definitely be buying these again! What's your favorite allergen-free breadcrumb? I had the pleasure of meeting Sloane Miller, author of Allergic Girl, Adventures in Living Well with Food Allergies , at a recent meeting of the Hudson Valley Celiac Support Group, where she spoke to the group and signed copies of her new book. While most of us that are food allergy parents worry (and write about) issues like kids going to school, and birthday parties, and how to deal with issues in the classroom, Sloane tackles the emotional side of food allergies. Dating (and kissing) with food allergies. How to deal with family members, friends, and others who just really don’t get it. Eating out (which she does quite often and quite successfully). And most importantly -- how to become your own best advocate and find allies along the way. This is a book that every teen and young adult with food allergies should read. As my college age food-allergic son prepares to really go off on his own for the first time, I’m thrilled to be able to share Sloane’s story with him. I’ve been wanting to try the new Betty Crocker gluten-free mixes since they came out last fall. These products are easy to find in mainstream grocery stores (in my grocery store they sit on the shelf right next to the traditional cake mixes) and are less expensive than many of their gluten-free cousins (but less cost-effective when you consider that one box only makes a single layer cake). I decided to try the chocolate cake. I found that instead of the 43-48 minutes suggested for baking that I only needed 35 minutes – significantly less baking time. I topped it with my own vanilla glaze. The mix is based on rice flour, potato starch, and tapioca starch – a pretty standard gluten-free combination – but compared to other gluten-free chocolate cakes, I found this one to be very grainy. However, if you need to avoid xantham gum this is a good choice as it uses guar gum instead. Have you tried the gluten-free Betty Crocker mixes yet? What do you think? Jules Gluten Free has a new bread mix that I just had to try. This mix starts with the Jules flour, but is also fortified with lots of vitamins, and even has some buckwheat and flaxseed flour in it! For the eggs I used Ener-G egg replacer (3 tsp Ener-G with 4 tbsp water). Instead of 1 ¼ cups yogurt I used ½ cup of original hemp milk and ½ cup of applesauce. Then I added 3 tbsp of water. This bread was great warm with dinner, but more importantly it makes a great sandwich bread. Two days later I made sandwiches. It didn’t require toasting to make it palatable, and I had none of the moisture problems that we often see with gluten-free breads. I think it would also be great to make sandwich rolls from. This is one mix that I will keep stocked in the pantry! Sometimes I am disappointed when I try new products, and sometimes I am delighted. We can’t use soy milk here due to soy allergies. I find rice milk to be just too bland and sometimes gritty. My go to milk has been hemp – and I continue to use hemp milk of all varieties. But cream… well that’s the holy grail as far as non-dairy milk goes. I think I’ve found the answer. This “cream” made from coconut milk by So Delicious, really looks like cream, and it behaves like cream too! Makes about one cup of frosting. For me this is enough for a double-decker cake. Neither the coconut oil or the cream gives off a strong taste, allowing the vanilla to shine through.